Harold Montee, on the left above, was born in Redlands, Calif. He was the first passenger transport pilot in Southern California, flying from Los Angeles to the Imperial Valley in 1921. In the 1920s, he and his brothers were operators of the Mercury Flying Service and the K.W. Montee Aircraft Co. at Clover Field, now Santa Monica Airport, in Santa Monica, Calif. Their father, James, soloed an airplane in 1922 at age 60 and last flew at age 94, then the oldest active pilot in the U.S. The family became famous, known as the "Flying Montees." Harold became an inspector for the Bureau of Air Commerce, which later became the Civil Aeronautics Authority (CAA) and finally, the Federal Aviation Administration (FAA). He was a Seaboard vice president in the early years. He was based in Washington. D.C. where he represented the company in government matters. In the photo, Harold is showing his 90-year-old father one of Seaboard's DC-4s. 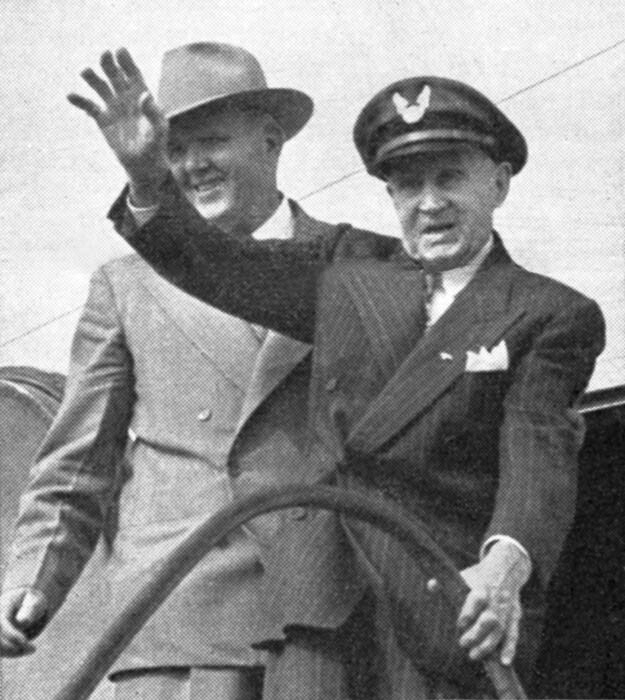 The photo appeared in the November 1952 issue of The Airtrader, the company newsletter.